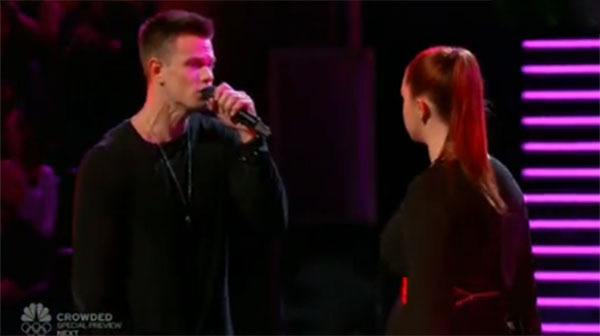 Nick Hagelin and Jessica Crosbie from Team Pharrell performed ‘Electric Feel’ on The Voice Season 10 Battle Rounds, Tuesday, March 15, 2016. “Jessica, you are great. Nick, you are amazing up there,” said Adam Levine. “Nick, you are spending so much time for your falsetto, I really loved your voice,” said Blake Shelton. “Jessica, I couldn’t get the exact feel of the artist you wanted to be,” said Christina Aguilera. “You guys definitely brought it. Nick, that note in the middle, it worked. Jessica, you have so much range that I wanted to hear,” said Pharrell Williams. The winner of this battle is Nick Hagelin. Adam Levine steals Jessica Crosbie. Watch their performance on the video below.